“Your Name” is a creative and unique movie. 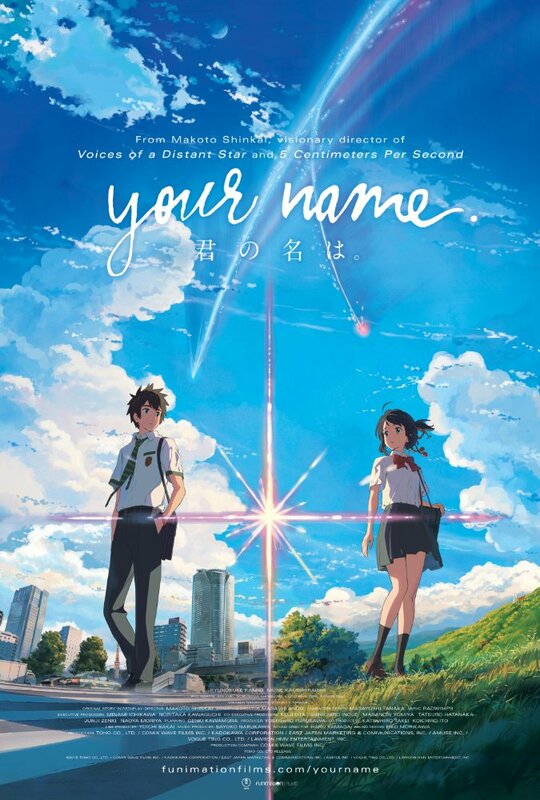 I don’t think I have ever been emotional moved by an anime movie like I was with “Your Name”. When you first read the synopsis you can be forgiven if you think move might be just silly teenage love story movie, especially you read “But one night, they suddenly switch places”. That is exactly what I thought when I read it. I could not have been more wrong. I guess there was a reason that it was the top film in Japan for 2016 . The trailer doesn’t do justice to the movie and how complex it is. I don’t want to give away to much in this review, so I will not discuss the plot too much. I will say that the main guts of the story were inspired and didn’t feel forced. Normally “switching places” movies rely on comedy to get the audience to forget how ridiculous this concept is. “Your Name” takes a very unique approach and yes there is still comical events that happens due to the switching of places but it feels natural in this story. As the movie progresses you get emotionally invested in the two main characters. I found myself getting exciting at the high points and was moved (I cried) at one of the more emotional points. It has the depth and complexity of any drama in cinema today. My attitude on what to expect from anime and animated movies has changed. The bar has been raised. This movie is an instant classic and marks new point cinema history. Anime movies have grown up. I was also blown away about the amount of detail that is packed into everything you see. You can tell there was a lot of time spent making make every frame a piece of art. From the lighting and the color palette to the cinematography this movie is visual eye candy. It is very beautiful to look at and has it own style unlike anything I have seen in awhile. The shots are drawn in away that just pulls you into the story even more. “Your Name” was release in 2016 in Japan and will be release in the USA on April 7th in two versions: English-language dub (English voice-overs) and Japanese with English subtitles. I can’t wait to get to see this movie again on big screen. You can read the full synopsis and more about the director (Makoto Shinkai) at Funimation’s website.